From Forest Street’s “Restaurant Row” to the establishments on Elm, Main and Pine Streets, New Canaan offers a diverse and ever-evolving lineup of restaurants. The choices in town are particularly impressive not only given the size of town, but also when one considers how far New Canaan has come in morphing into a culinary destination in a relatively short amount of time. As recently as the 1960’s and ‘70s, dining options were somewhat limited for residents and the food was far from exciting. Patricia Brooks—food critic for the New York Times and New Canaan resident since 1959—remembers those days well. There were formal dinners at the Roger Sherman Inn, while those seeking more casual fare would head to The Heritage on Baldwin Avenue (now incorporated into Cherry Street, near Locust Avenue). 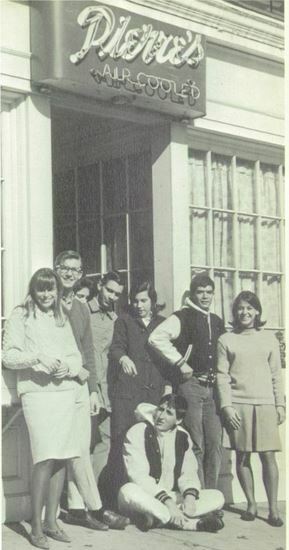 Even so, there was one place in town that stood out for New Canaanites, a place where those who wanted to see and be seen would congregate every day for more than three decades. 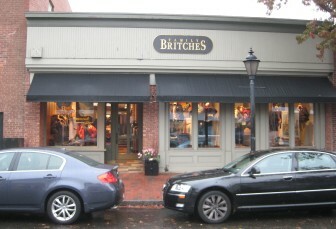 Located at Elm Street where Family Britches currently is housed, Pierre’s was more commonly called “Izzy’s Place” in honor of owner Israel “Izzy” Cohen. Divided into two sections, Izzy’s had a “fancy” dining room, a popular destination for lunch, particularly for New Canaan housewives who would dress up and make an event of the meal. But it was the bar room that made Izzy’s an institution. New Canaan’s version of the famed Round Table at NYC’s Algonquin Hotel, the front table at Izzy’s was unofficially “reserved” for the revered regulars who held court at the restaurant, including Judge Julius Groher, Selectman Pete Raymond, various attorneys and town officials who would discuss, dissect and debate the various issues of the town on a daily basis. If anyone needed to find the pulse of New Canaan, they looked no further than the bar room at Izzy’s, where the air was filled with all the latest news, sports, gossip, and politics. A former flyweight prizefighter, Izzy Cohen ran a candy and cigarette store in New Canaan in the late-1920’s which also had a gym to help launch his boxing career. In the ‘30s he partnered with Joe Doyle, a blind man who owned the predecessor to Pierre’s at 39 Elm St., Doyle’s Tavern. Cohen ran the restaurant so well that upon Doyle’s death in 1944, his appreciative heirs gave the business to Cohen as an inheritance, and it took off from there. Not only did Cohen transform the newly renamed Pierre’s into New Canaan’s preeminent local hangout, but he gave back to the community itself. 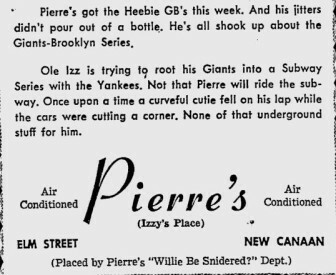 Izzy—often referred to as “New Canaan’s Toots Shor” after the legendary NYC restaurateur— was a particularly generous sponsor of local sports teams, including the legendary New Canaan Zebras baseball club, coached by Judge Groher and named for the striped décor of Pierre’s. Cohen also established a hometown newsletter circulated monthly to local men enlisted in the Armed Forces during World War II, and spearheaded a movement called “Operation Smokescreen”, sending candy and cigarettes overseas during the war years. When the servicemen returned home, Cohen hosted a clambake in their honor on a farm in nearby Vista, NY. In the late ‘50s, Izzy’s Place played host to a live sports radio program called “New Canaan USA,” broadcast over Stamford’s WSTC. Izzy’s was also one of the first restaurants to feature a television in its bar, which was almost constantly tuned in to whatever sporting event was on at the time. The news of Izzy Cohen nearly collapsing from excitement while watching the 1959 Kentucky Derby made the local papers. The drama was justified, as Cohen supposedly won $300 on the winning horse — quite a hefty prize back in those days. By the mid-1970’s, Izzy’s run was coming to a close. Changing tastes and increased competition from newer restaurants—most notably Fat Tuesday’s which opened a little further up Elm Street—cut into the business, which had been sold by Cohen the previous decade. 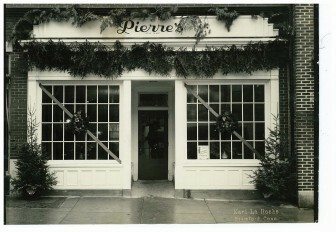 When Pierre’s finally shut its doors for good in 1976, it was the end of an era in New Canaan’s history. Although new establishments such as Gates and Cherrystreet East would soon vie for the title of unofficial town headquarters, it was not quite the same.